“I would like to introduce myself properly, my name is Emily Taggart and I have been using your “Calm mix” in the UK, well my horse has! I wanted to say thank you so much for producing such a great calmer for horses, I hope you don’t mind me dropping you an email but I wanted to let you know a little more about myself and the horse I decided to use it on. I bought Miller, a 16.1, brown, 4 year old Gelding about 6 months ago from a dealer who I buy the majority of my horses from. I spotted this horse in the field and asked the dealer if they would show him to me but they tried to convince me otherwise…. Of course I put him in a field for quarantine purposes which was about 2 acres in size and did join up with him in 3 days. I lunged Miller for 2 weeks and he rodeoed like nothing I had ever seen before, it took me that long to realize he wasn’t going to ever stop the broncing so I decided to get on him. I am a professional event rider and break, re-school and take on tricky horses for a living but this one definitely took some bravery. I knew that if I didn’t stay on him broncing then that would be the end of that. He allowed me to sit on him, take 6 steps forward and then he bronced. I knew instantly that he didn’t want to get me off but he was very scared and wasn’t quite sure what was happening. After the broncing we managed about 5 minutes of walking and then I stood him still and wondered how I would get off him as his issues were seeing things on the right and I had to fling my right leg over to get off….thankfully he stood like a rock, probably too frightened to move. I have worked so hard on this horse and he believes in me 100% but he is still quite an anxious gelding. Since using the calm mix he has definitely become more chilled out about life, he is now a stabled horse whereas before I had him out 24/7 to keep him calm. I can now give him a few days off and he doesn’t bat an eyelid even if he hasn’t been in the field every day for hours. He went to his first jumping competition at the weekend and took everything in his stride, he was a little anxious ridden initially but I kept him on the daily dose of 1 scoop per day rather than increasing it until I saw his reaction and had something to measure the next outing on. 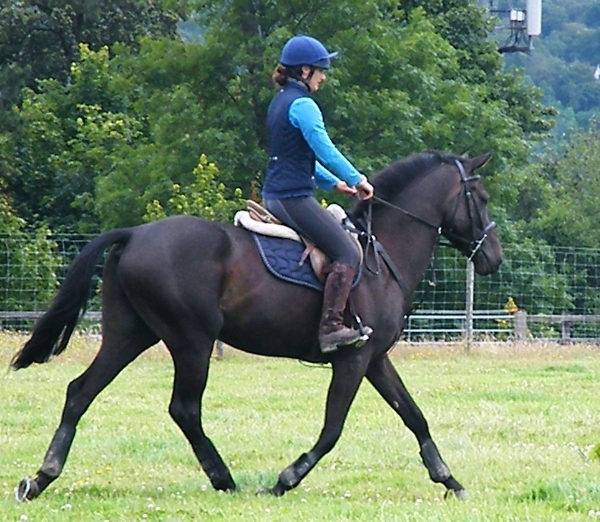 I deal with a lot of youngsters and quirky horses and I always like to give them a legal calmer for horses for their first couple of outings as it helps take the edge off them and provides them with the confidence they need to compete rather than having to deal with anxiety issues as well as all the new sights and sounds. For more info on Emily and Miller – click here. Since using the calm mix he has definitely become more chilled out about life, he is now a stabled horse whereas before I had him out 24/7 to keep him calm.